Last month, I went to Tokyo. It was my first time going off somewhere alone, so I was nervous! My target was something called the Art Aquarium Exhibition. 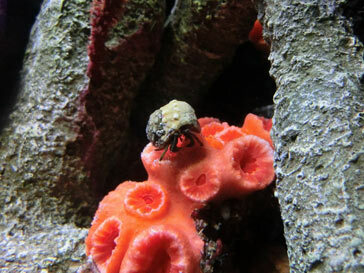 So now I'll write about my trip, though focusing on pictures of the aquarium over the trip itself. Of course, it's filled with pictures of goldfish. Take caution if you're not good with those. Cut for length and lots of photos. 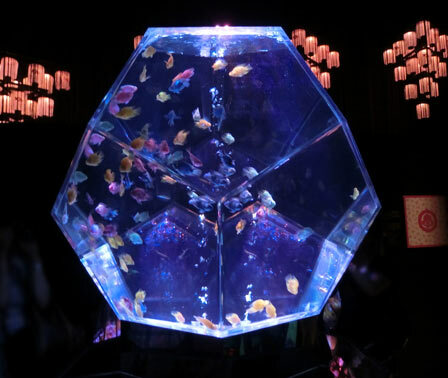 I'd been seeing this Art Aquarium Exhibition mentioned on commercials and online. 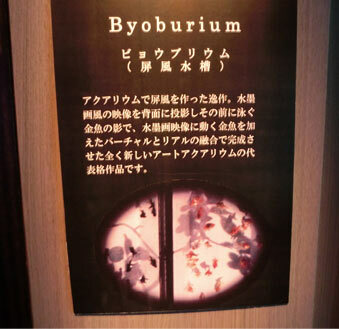 I certainly like the "aquarium" part, so it captivated my interest. And so I went. A simple reasoning. On the day of, I arrived at Haneda airport. It took an hour just. Airplanes sure are fast! I took some photos at the airport, but I don't dare post them with all the clearly-depicted people in them... That's unfortunate. First, I went to my hotel. The location of which is a secret. ↑ A photo I felt I could show. So many lines. I just don't get it. 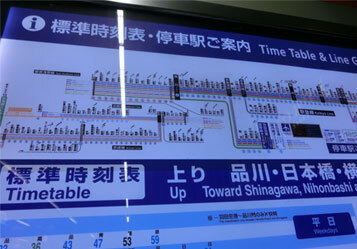 I initially thought I could just walk a ways from the station to the hotel, but that was an incorrect assumption. - It was so hot, I thought I was gonna die... and so I did! - So many Family Marts! A Family Mart at every corner. Lamenting that I hadn't brought a parasol, I eventually made it to the hotel. Everywhere was too crowded to get lunch, to boot. Ultimately, around 3, I found a hamburger place. 20% energy remaining... Thus, too tired to take photos. Sorry! 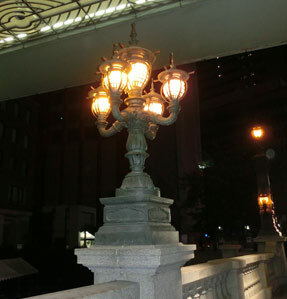 Eventually, I arrived at Nihonbashi! But I had a little while more to walk, and again went off lost in random directions. I really should have been looking at a map. After finally making it to the exhibition, I had only 5% energy remaining! It was a 5% I had to cherish! 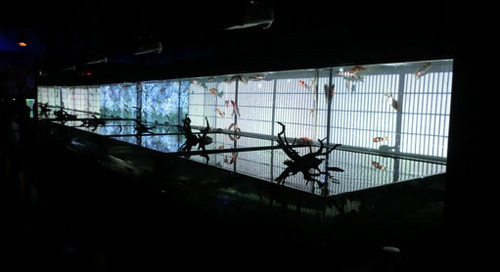 The Art Aquarium went until 7 PM, at which point it transformed into a Night Aquarium. Thus, my plan was to arrive at 6:30. 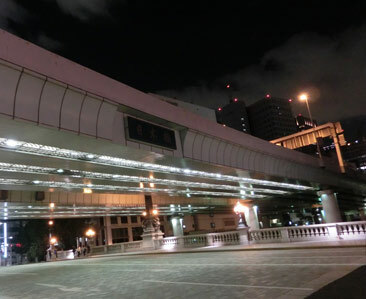 Though a little late, I arrived at the Nihonbashi Mitsui Hall. People were allowed flash-less photography. It brings me to tears how many blurry photos I took. My first sighting of goldfish. Cute little Wakin goldfish. 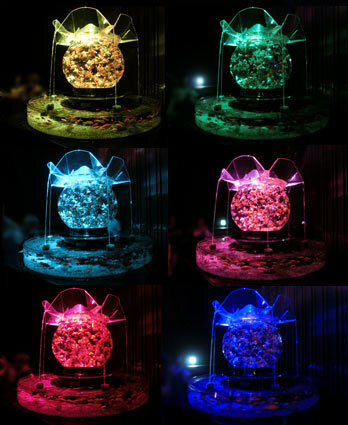 Being that it was an Art Aquarium, the lights illuminating the tanks changed to all sorts of colors. 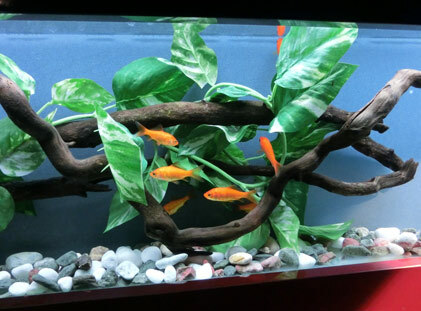 It was interesting to see how the goldfish changed color too as a result. 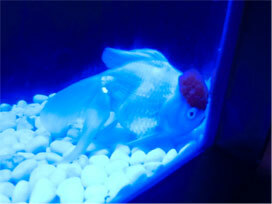 For example: There was this ↑ ranchu, but when illuminated with a blue light, the red parts on its head turned dark. Like a tiny little afro. I continued seeing similar tanks for a while. Exiting a hall of tanks, I reached a wide open area. What really caught my eye there was the "Courtesan." 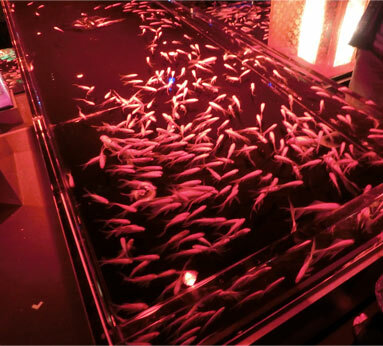 A large number of goldfish were swimming in a huge goldfish bowl. * The surrounding people have been cut out. Observing the goldfish from below, I got the impression they were all swimming clockwise. But sometimes a few would go against the grain, of course. Naturally, the changing colors were quite beautiful here. I attempted to capture the different lightings. 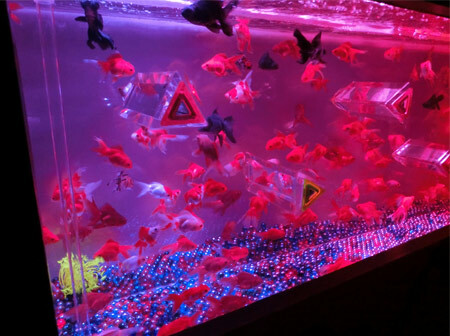 There were other unique fish tanks, of course. There was another similar tank, but people got in the way of the photo. A huge number of Wakin. I think they might be the cutest after all. Next was the Underwater Seasonal Scroll. I liked it just as much as the Courtesan. 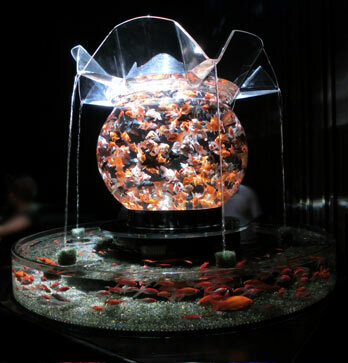 In the background were images themed around Japanese gardens, but in front were goldfish. These two things alone seemed to fit together all too well. 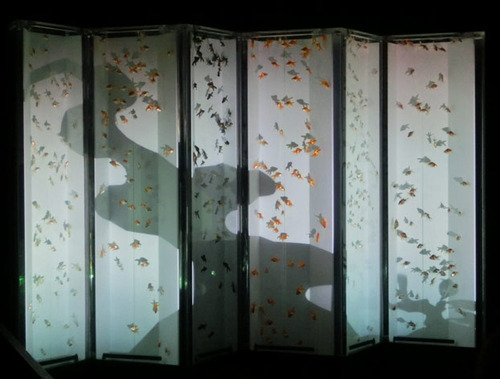 The shadows of the goldfish look very nice. A piece very evocative of Japan, I feel. Once appropriately soothed by the underwater scroll, I found a tank with a mysterious triangle on it. It was apparently a kaleidoscope for viewing the fish with. Nothin'... You avoiding me, fish?! 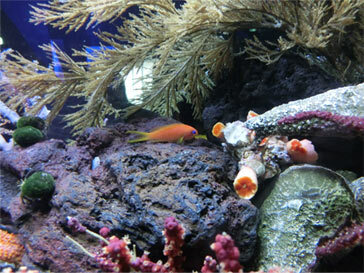 I then reached the exit of the aquarium. I took photos of some bright tanks near the exit. I'm glad I was able to get clear photos here. This one also felt very classical and Japanese. 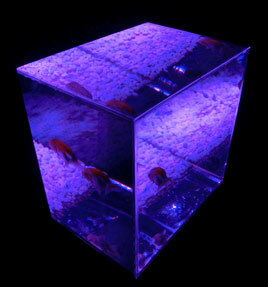 As the name implies, it's a folding-screen-shaped fish tank. 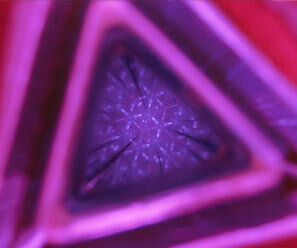 Behind, dark patterns evoked images of an ancient world. The goldfish swam lackadaisically as ever. 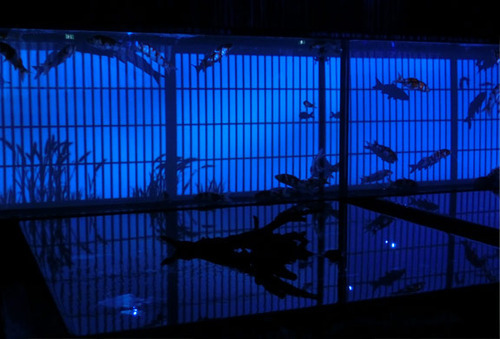 During my visit, the aquarium transformed into a Night Aquarium, and music began to play. It was actually kind of loud... It was disappointing how it washed away the calming sounds of the underwater scroll. The Night Aquarium also started selling cocktails, however, so that helped my enjoyment. Having had my fill, I headed for the exit. I should have gone there first. Overall, I had a great time. It was all quite pretty! Personally, I think the Underwater Seasonal Scroll was my favorite. There were plenty of displays I didn't post photos of, so I recommend going there yourself if you ever have the chance! It's open until September 24th. Now, then... I had completed my objective. I had to walk back to the hotel, but my energy sat at -10%. Regardless, I pressed on. Streetlights! Everything was getting dark around 8. 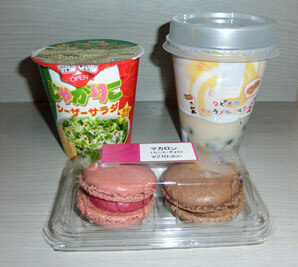 I had thought of eating something nice since I was in Tokyo, but I was too tired to feel hungry. So I just bought sweets and such in a shopping district on the way to the hotel. I went to a Family Mart, too! Of course, Garry has his talk about macarons, but to be honest, I don't like them THAT much. Regardless, I bought some since I saw them in the shop. And I feel like they were a fair bit more tasty than the ones I had before. Perhaps it's merely because the first ones didn't taste good that I don't care for them much... Even so, the price is a little steep for the taste. Once at the hotel, I relaxed and ate snacks. So this is what living alone might be like, I thought. I wouldn't want to watch any scary shows like this, coward that I am. But it also felt very liberating. The next day, back at Haneda. I had a lot of time to loiter around. 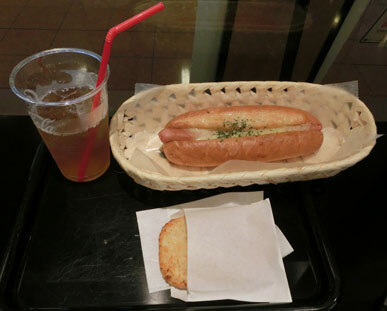 I had lunch in the airport at a Coca-Cola shop. A cheese dog and hash brown. Tasty! 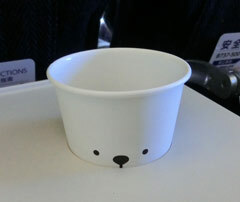 I bought some souvenirs and got on the plane. I felt too sick to drink when I arrived, so I got some onion soup. 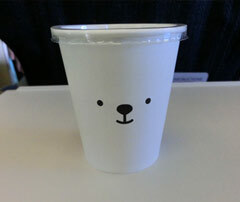 It came in a cute cup. Apparently it's the Air Do mascot. And so I arrived back in Hokkaido. It was a real ordeal getting back home from there, but I made it. It was fun! Tiring, but worth it. I'd like to go to Tokyo again. But any time but summer would be preferable. Really... The heat was crazy. I felt like I was being baked alive! If I have the time and money, I'd like to go again! And that was my Tokyo (goldfish) report. Hopefully I can improve my shaky photography by next time.